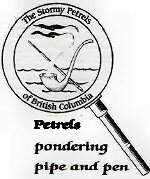 The next gathering of the Stormy Petrels of BC will take place at the lovely North Vancouver home of our own “Gloria Scott” at 7:00 pm on Tuesday, December 6th. Our Petrel tree will make an appearance adorned with items (ornaments and such) reflecting some of the cases from the Canon. My aim is to eventually have all 60 adventures represented. The devil’s hound – it’s true! There are at least a dozen stories represented here. Can you name them? The person who can name the most at the December jollification shall be rewarded with a lovely prize.